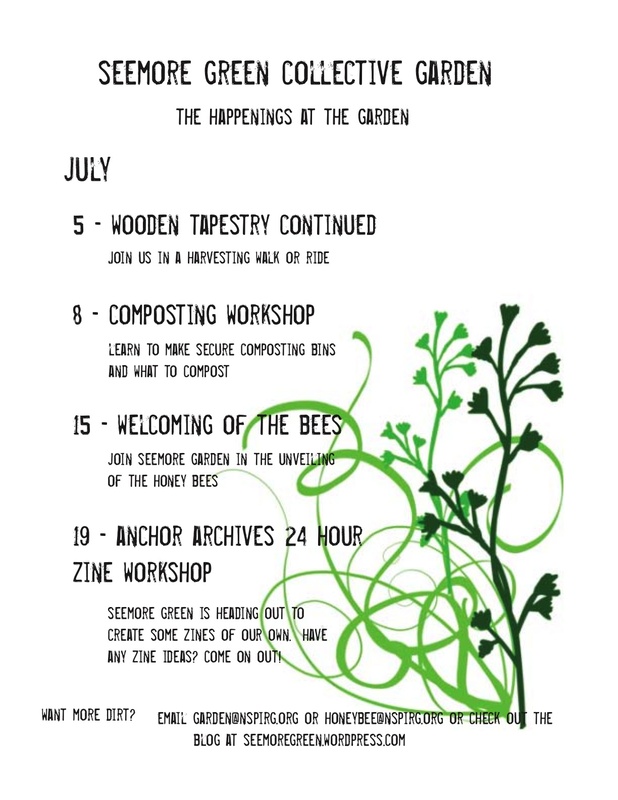 This week in Seemore Green, we had planned a composting workshop for Tuesday, but due to the Chebucto madness, we are going to postpone the workshop for a week, and head down to city hall for a celebration of Active Community. This tuesday July 8th @ 5pm Grand Parade Square. There will be music and dancing. Wear yellow, bring your friends, bring your kids and LETS SHOW OUR COUNCIL WHAT WE VALUE FOR OUR FUTURE AND OUR COMMUNITIES. July 15th Urban Composting with Compostmeister Silas Magee. 5pm. July 22. Welcoming the Bees!!! How to have urban honeybees, the first of our new ongoing project and workshop series. July 29. Wildharvesting Walkabout; finding medicines and dye plants with Jayme and Brenna. Seemore Green Calender for June. Meeting point for all events: Seemore Green- behind 1411 Seymour Street, unless noted. June 3 (bike week): guerrilla gardening bike ride to see community gardens; bring your bike. make some seed bombs if you can and lets ride around checking out gardens. Meet at 5pm at Seemore Green, we will leave by 5:30. June 7 (Saturday): Native plant gardening and plant walk, with Billy the Elder, and hopefully Laurie Lacey! 2-4pm, meet at Seemore Green with walking shoes. June 8 (Sunday): Sheet mulch workshop with Jen Stotland. 1pm, Seemore. June 10 (Tuesday): Native plant gardening and walk. 5pm. June 17 (Tuesday): Woven willow fence workshop. Brenna and Sanda, NSCAD textile student and prof will be guiding us to weave a story in willow on the fence for the grapes and honeysuckle to grow up. 5-7pm. June 24 (Tuesday): bike trailer building. With help from Dave, Wayne, and Leah we can build ourselves some simple bike trailers. I will post the list of ingredients on the blog over the next week or so, so if you want one, start scavenging &/or let us what you are thinking and needing. Gardeners need bike trailers! June 28 (Saturday) at the FREESKOOL: 12:30 Creative Containers with Jayme Melrose. Start scavenging containers. passionate, and funny- a don’t-miss kinda session. Creative Containers workshop at the Dal women’s Centre garden, 1-4pm. Potluck style: bring some local-organic nibblies if you can. For the workshop: you bring the containers (cups, pots, blenders, barrels… garbage night scavenging starts getting good these days!). We have the worm castings, soil, seeds, and some little plants. Let’s make a bunch of great containers for our homes, the community gardens, and beyond. Join international speaker Jason Hofman of the Soil FoodWeb Atlantic to hear about how healthy soil functions, and how it is possible to grow more healthy, affordable food while helping the planet heal at the same time. The presentation and film will be followed by an opportunity to be part of the breakthrough via CEDIFs. Free. + You could win a compost thermometer! Put on by the Food Action Committee -Ecology Action Centre, Seemore Green Collective Garden, & Soil FoodWeb Canada East. So September. The Thursday evening garden parties continue. Tonight (the 6th) from 6-7, I will do a little workshop on saving seed, by request. I am passionate on this subject, believing it is a critical part of our relationship to the food web. For a great presentation on seed saving, check out the Vanpermaculture website: at the bottom is ‘Sarah’s Seed Presentation’, a downloadable powerpoint that I highly, highly recommend. The next two Thursdays will see gardenplay-workparties from 5:30-7pm. Clean up, harvesting, cover cropping… a little visioning for next year. If you have any interest in gardening, please come by. Saturday the 22nd, there will be a garden creation workparty at the Dal Women’s Centre. There is permission and whole back yard to turn into a garden; there will be construction, layout and sheet-mulching to do. All ages, abilities, genders, and interests welcome. The really exciting projects we have got going on now too, is the wild-harvesting guerrilla-gardeners. We met last Sunday (9am at OneWorld), and rode around the north end checking out sites to guerilla garden. We found 4 spots that we all got super excited about. The crew is doing the research on the sites: there may even be a site that we can build some water-catchment and do some nursery work. This Sunday, the 9th, we are going to harvest some roots, -dandelion, burdock, and hopefully some yellowdock, and then make some tincture at my place. Bring a jar with a lid, and some vodka, gin, or a few dollars. I will bring some shovels. So, hope to see you soon. Everyone is always welcome – all ages, genders, abilities, interests…. whatever other variables you might use an excuse to not come by; you are welcome. The survival of our species depends on our ability to feed ourselves. Life skills, baby… life skills. Learn how, why, and build your own in a free collective workparty. When: saturday, aug 11, starting at 11:00 am. ~ And Wayne Groszko, renewable energy coordinator at the Ecology Action Centre. ……the organizers will also bring some of these tools and materials, so come anyway if you don’t have tools or materials and we’ll use what we have. We will bring some materials, and you can also bring your own scavenged materials to build one of your own. We may have access to a quantity of usable glass, and we have some good wood already. Check the SeeMore Green blog here for more information and dialogue on gathering the materials. So I knew that a garden needs water, and a good rain collection system would be a much loved resource in future. I got a hold of some perfect barrels by putting as WANTED: rain barrels posting up on hrm_freecycle. They were delivered by Steven Spinney of Acadia Seaplants, with a lovely note. They are big, blue, 200L, and had held Certified Organic seaweed fertilizer. There is downspout that comes down into the garden, making temporary puddles in the garden after a heavy rain. One of the first folks to a garden workparty was Derek, and upon further inquiry, he is a plumbing apprentice. Naturally, I asked him about interconnecting rainbarrels. I know how important they are, and roughly how I saw them going together, but I do not really know the technicalities . In the emails and on the blog we invited input and suggestions, but none came. Derek asked some of the boys at work, we chatted about strategies, and he went out to the plumbing supply shop his company frequents and bought the gear we needed. When we talked on Friday night, he sounded a bit nervous about having spent a bit more than we were aiming for, but he wanted to get it bought that day, and went with the system that he would do if it was his. He went with the system that he felt would not get clogged, was easy to switch barrels out (to clean them or whatever), and using the least amount of expensive fittings. On Saturday morning, shortly after I had arrived with two bails of hay that I towed in one of the collective bike trailers (hella heavy, but really rewarding to tow through traffic), Derek showed up with all the gear. The one key part that I had overlooked was the necessary reciprocating saw needed to get into the barrel. I know no one in town, and apparently there are no tool rental places nearby (like there are in Vancouver)… and then Lance and Veronica showed up! Lance rolled in with a couple of brilliant ideas right off the get go, such as cutting the top in a semi-circle and attaching it with little hinges to form a lid. And then he went home to get the rest of the tools we needed. At this point, my heart flickered with satisfaction. With generosity, resourcefulness, and collaboration as the fabric of our projects, surely there is grace. In the meantime, Dalhousie biology prof whose articles I have read in Canadian Organic Growers, Dave Patriquin, came by the garden to share a conversation I greatly enjoyed. Lance brought in the tools we needed, Derek went a grabbed a length of pipe, and the interconnection began. Two others came by to check it out, and both commented that they were disappointed to see that it looked was made from expensive materials as they were looking for more low-cost solutions. For the interconnection of the next three barrels we extend the invitation for input as how to best do this. One guy who showed up, Geoff, is reported to be the genius of great low-cost solutions, so I am inviting him to guide the next three. David Baldwin, the apple guy!, checked the scene out as we were starting, then left to do his other errands, and returned. He had suggested to check out boating shops for fittings, and went by a boat shop to see if his suggestion was valid. The Binnacle (card at the garden) is where he went, and came back with an appropriate garden-hose diameter fitting for $3.95. Prices range, but apparently there are some really interesting fittings there. And interestingly, when David looked at Derek’s receipt, he was surprised at the how comparable the prices were. Another suggestion was Lee Valley, I had totally forgotten about them, but I bet they do have some moderately priced appropriate gear. Freecycle is of course another great place to look. And where else folks? Where would you or did you get your gear? I am thrilled with the system that we set up this weekend. I believe it was and will be worth every penny. I think it represents the more ‘ideal’ system, especially for brewing herbal fertilizers in. And I think it will be really easy to maintain, last a while, and could be added to in future. I am stoked by the interactions that went on, (although I am working on being a better hostess). A copy of the receipt is available if you want it. And, if you have input about putting together a tight system on the super cheap, then tell us your secrets, and hopefully Geoff will help lead us there. For the next three we need to build some sort of stand for the next three barrels to get them a few feet off the ground so that we can fill watering cans and even run a short hose. We have some wood. Any building or design volunteers? Come on with your suggestions now, rather than laughing at the not-as-good-as-it-could-be design that may result otherwise! Ah yes, and sweet thanks to the sweet one who brought gifts of nettle, yarrow, and plantain to the garden. What lovely allies to bring in. Thank you .